Maine delegates to the Democratic National Convention discuss politick in Aug. 1968 in Chicago. They are delegates Floyd Harding (from left), a state senator from Presque Isle, and Neil Rolde of York, and alternate delegate Owen Hancock of Casco. Former politician, historian and philanthropist Neil Rolde has died. Rolde, who authored more than a dozen books and served as Democratic leader in the Maine House in the 1970s, is being remembered for his public service and contributions to Maine history. Rolde grew up in Massachusetts, but made his adult life in Maine. He was an aide and campaign manager for Democratic Gov. Ken Curtis. He represented York in the Legislature from 1974 to 1990, and was a member of many boards and commissions, including Maine Public’s Board of Trustees, for which he served as chairman. Former state lawmaker and author Neil Rolde, in 2013. Rolde devoted his later years to writing, mostly about Maine history but, more recently, about U.S. actions during the Holocaust and life in politics. 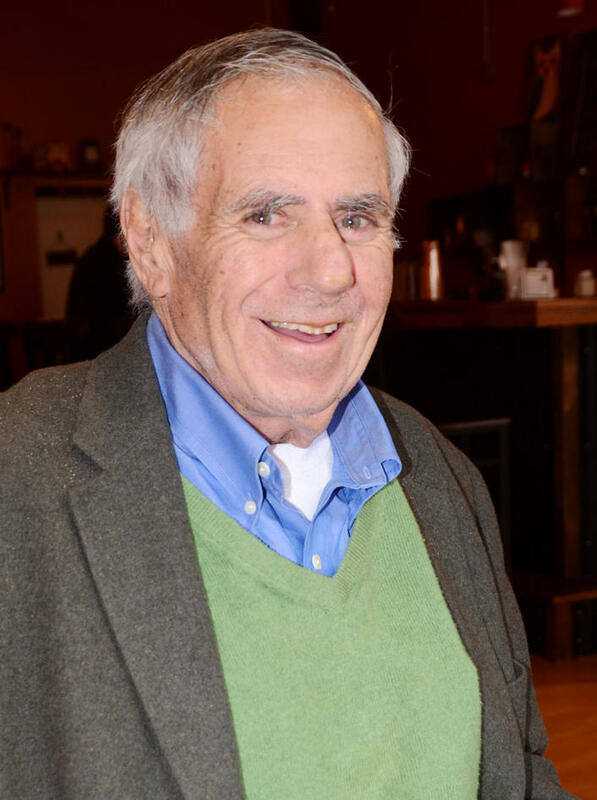 Two years ago, he spoke with Maine Public about his book “Real Political Tales: Short Stories By A Veteran Politician,” which Rolde says he drew from his own time in Augusta. “We would go and beat each other’s brains out on the floor, but then we’d go have a drink and we knew each others families and that sort of stuff,” he said. In contrast to the highly polarized atmosphere that surrounds modern politics, Rolde says the statehouse of the 1970s and ’80s was collegial. “There were lots of people that I worked on bills, I co-sponsored bills with. We conducted ourselves in a way that was dignified, respectful and at the same time productive. And some of the best laughs I had were on the floor. Some people had great senses of humor,” he said. In 1990, Rolde lost to William S. Cohen in a race for the U.S. Senate in which Rolde advocated for universal health care coverage. Democratic U.S. Rep. Chellie Pingree of Maine’s 1st District, who says she met Rolde when she first got into politics, says he was a sage political advisor and also made a huge contribution as an author and historian. “You know, obscure kinds of things about Maine history, international history, and I think it was because he had this belief that those who don’t understand history are doomed to repeat their mistakes,” she says. Adam Lee, chairman of Lee Auto Malls and a Maine Public Board member, says he served with Rolde on a number of boards. Listen to Rolde spoke with Irwin Gratz in 2015 about about his book “Real Political Tales: Short Stories By A Veteran Politician,” which the author says he drew from his own his own time in Augusta. Irwin Gratz interviews Neil Rolde in 2015. ROLDE: They’re people based, sometimes on real people that I know. And real incidents that I was involved with. But, disguised, in a way, in order to bring out that sense you know — just ordinary folks doing a fairly extraordinary kind of work. GRATZ: Did you also take the license to exaggerate, or are these things as they really happened? ROLDE: Yeah, no, I did not exaggerate. I think that’s what we get about plays and movies and so forth about political life, is exaggeration. I mean, you know, we’re all a bunch of connivers, or there’s maybe one good guy, that sort of thing, and that’s not the way it really worked. Now, I have to do the caveat that Maine may be a little bit different than other states. I mean, I grew up in Massachusetts and I don’t think the book would be the same. GRATZ: Now, you know there’s been a lot of talk in the last few years, that one of the problems in Congress is that the members don’t seem to be relating to each other personally as well and, if they only did that, things would be better. From your experience in the Maine Legislature, talk to me about those human connections: how big a part of legislating were they? ROLDE: Well, you know I can’t say how it is today. But, in my day, we were very collegial. And one of my short stories is about a bipartisan group meeting at somebody’s house, and we did that. I always talk about my friend Jim Briggs. He was a Republican legislator from Caribou. And, he was an older guy. He’d been in the House and Senate, back when it was all totally Republican. And then he got elected and came down and I was always joking that we were freshmen Democrats; we made him an honorary freshman Democrat. And Jim and I became very close friends. He was one of the great pioneers of the environment in this state. So, he and I hit it off very well. We were both on the Natural Resources Committee together. And, you know, I’d go and stay with him in Caribou and, there was a great collegiality. We would get out there and beat each others brains out on the floor, but then we could go have a drink. And we knew each other’s family and that sort of stuff. GRATZ: Does that collegiality ever translate into legislation? ROLDE: There was a lot of criss-crossing. Now, take somebody like Jim Briggs that I mentioned. Jim was a Republican, staunch Republican. But, when it came to the environment, first of all, he took a lot of lumps in his own party for doing that. And we all worked together very, very well. But, you know, there were lots of people I worked on bills, I co-sponsored bills with. We conducted ourselves in a way that was dignified, respectful and, at the same time, productive. And, some of the best laughs I ever had were on the floor. Some people had great senses of humor. PORTLAND, Maine - Neil Rolde says the stories in his new book are real; the names were changed to protect - the politicians. Rolde, a former state legislator from York, has written a new book, "Real Political Tales: Short Stories by a Veteran Politician." Rolde told MPBN's Irwin Gratz that he drew the stories from his own time in Augusta.